This post by MATTHEW FREEMAN: This is the electrical stellar model that I developed over the last five years, it is based a great deal on various books from EU - and certainly the work of the Thunderbolts team. I am not sure how much my model varies from the 'standard EU model' if there is such a thing. I think the model introduces some new information. The model is consistent with all known physical data - including the new information from the Safire project. I tried to get a copy of my books to Wal earlier, but pretty sure he didn't get around to them - so this is going to be basically an excerpt from my second book. In that book I also provide mechanical explanations for light and gravity (and heat, magnetism etc). I have included some additional information not included in the books in the following format (Note: xyz). I have also omitted a couple of images from this post. Feedback, corrections and commentary welcomed. In the last book, we introduced the electrical model of the Sun, and in this book we are going to drill down to a deeper level. This section will add some more detail - but will not yet answer every question. However, this book will not draw to a close before we have explained every process and element of the stellar model - we are going to be thorough. (Note: The electric field that surrounds the Sun is explained as a consequence of SURFACE GRAVITY - the precise mechanism is explained in the last section of the book - along with a mechanical explanation of MASS, inertia and so forth). Given that we have explained the formation of our star Sol via a magnetic pinch, what is its structure, what materials was it formed from? It is certain that a dizzying array of chemical and nuclear reactions must occur during such a cosmic arc, beyond our current ability to quantify. However, we can still get a rough idea of how these materials are distributed. The elemental ions are organized according to charge by Marklund Convection, and higher charges move to the centre of the filament. Each atom has a number called atomic mass which indicates its maximum positive charge. When all the atoms are totally ionized and have no electrons at all, then the material will be organized according to 'atomic mass'. The heavy elements will be drawn into the middle, and lighter elements will go to the outside. When we consider the relative abundance of elements in outer space, and their mass and charge, then a specific arrangement must occur. They will produce a number of layers, the lightest elements of hydrogen and helium will be on the outside. Next there will be a layer of slightly heavier elements, mainly nitrogen, oxygen and some other gasses. In the centre a solid core must form from the heaviest elements - it will include oxygen, silica, iron and other metals. This geometry is appropriate to all planets and stars, but in the case of planets, a lot of the hydrogen will be converted into water, and most of the helium will probably escape into space. A star on the other hand has high surface gravity, which holds the gasses in, making it like an inflated balloon, and gasses become trapped inside. Therefore a star has an external shell made from hydrogen and helium, and this is where the heat is generated. The interior is comprised of layers of gasses, mainly oxygen and nitrogen, and these are hottest near the shell, and cooler towards the centre of the star. The first layers beneath the shell will be super-heated gas (plasma), and below that will be hot, but only partially ionized gasses (electrically conductive). Further down, neutral gasses will appear and finally clouds and condensates (liquids) may form towards the centre. At the very core of the star a solid body will be located, like a planet, comprised of heavier elements - we expect it to contain a lot of iron. Many electrical models for the Sun include an electric current flowing through space inside the solar system – however there is no evidence to support such an idea. Therefore we concluded that the Sun must be powered through magnetic induction. This is a very familiar process, and is used to distribute power from electrical stations to domestic users. The principle relies on winding the electric wires into coils, and creating magnetic flux – the flux then connects two sets of coils, and electromagnetic power is transferred without the need for a physical connection. In this model, the Sun's magnetic field is energized by charged particles flowing past our solar system – this flow has been observed and is called the ‘interstellar wind’. The magnetic flux lines from the Sun then converge, and energy is extracted locally by the Sun through induction. (Note: at this stage of the book I have not introduced the mechanism of GRAVITY - which is the principle source of energy for the Sun. I did not introduce it here because the idea of inductance would probably satisfy the average reader - however, that is NOT the primary source of energy, which I make clear in the final section). For this to work, there must be a 'coil' inside the Sun, comprised of plasma, and these are familiar structures in modern physics - they are called 'plasmoids'. These are regions of electrically conductive plasma that form specific shapes. They can be a doughnut or ring shape (a torus, or toroid), but more complex structures can form as a series of twists or coils. The plasmoid may consist of a series of rings or may be a complex twisted structure. These coils however are formed from 'field aligned currents', Birkeland currents, and therefore we can deduce the geometry. These must follow the overall path of the magnetic flux, and this will look like the loops that are often drawn around bar magnets. We have recently discovered such loops around the Earth, although very faint, and they are distributed evenly. So let's use a very simple structure for the plasmoid, and assume there is enough energy to create four such internal loops. These must be distributed as shown in the diagram (side view). This is a suitable arrangement for a very weak star, however we expect Sol to be more complex. The plasmoid can be logically divided into two parts, there is a central (or axial) flux tube that runs through the middle, and there are a series of loops. The central flux line is shown as a pair of cones, and this is because it must be comprised of several lines, and these will diverge slightly - giving it a conical shape. The other structures are the complete loops. Some of the internal loops can certainly extend outside and beyond the Sun, but in this case we are interested in the loops contained inside the body of the star. The loops extend from the top of the inner core, and curl around and enter the bottom of the core. If viewed from above, this would look like a wheel with a central hub and four spokes. In the previous book, we considered inductance to be the only mechanism which heated the Sun. In this book, we will reveal another mechanism, and recognize that inductance is probably a minor source of the Suns power - the main source is the force of gravity. The conversion of surface gravity into electrical and heat energy requires a deeper understanding of these phenomena - and we will discuss it in more detail in the final section. The stellar plasmoid must have loops that are contained inside the star, but there are many others which must extend out of the top and bottom and loop around the solar system. Scientists have recently detected such a loop which connects the Earth to the Sun. In a bar magnet, there are also flux lines that extend directly from the top of the poles and these are not curved, they project vertically outwards. It is impossible for a loop to exist if it is not a loop - in other words these must be connected to something, and it must form a circuit. The logical conclusion is that these specific lines of flux, the ones that project vertically out of the poles, connect one star to another. These must be the lines that form the body of the interstellar Birkeland current as shown in the diagram. We do not detect an electrical current flowing through the solar system and powering the Sun, but this flux line goes through the star, and also connects our star to another. We propose that outside of our immediate solar system - this flux line directs a flow of charged particles between stars – an interstellar current. We also propose that it transfers electrons inside the star, from one end to the other. During a period known as the solar minimum, the Sun usually forms huge dark regions called coronal holes, as seen in the image below. What causes this effect? If the Suns energy is derived electrically, then low energy means low electric current. One possible reason for low electric current is low electron population - in other words we deduce that there are simply less electrons in the region where the hole forms. We have proposed that a flux tube must extend through the central axis of the Sun and this is an electric current - it must transfer electrons in a north-south direction. This will cause a build-up of electrons at one end of the Sun, and deplete the electrons from the other. Therefore we propose that electric current through the internal flux tube leads to the depletion of electrons at one end of the Sun, resulting in the phenomenon we call a coronal hole. On reflection however, we can see an obvious problem with that idea, how can electrons flow from a depleted region (positive) to a region abundant with electrons (negative)? That is the wrong direction, electric currents flow from negative to positive regions. If the central flux tube was connected to the Suns surface, then this would be impossible, electrons could not flow in that direction. When we look at the north and south poles of the Sun however, we do not observe flux tubes connected to the surface. Therefore we conclude that the axial (central) flux tube does not connect with the surface - it operates inside the Sun, on the inner layers. When a large negative charge builds on the Suns outer surface, it must drive electrons away from the inner surface. This will produce a region with opposing charge, a positive region inside the star. Likewise, where the Suns outer surface is depleted of electrons, then logically, we expect to find more electrically negative material built up on the inner surface at that location. That means the interior is electrically opposite to what we see on the surface. Technically we can say the interior has opposite, or reversed electrical polarity compared to the surface. The axial flux tube is therefore moving electrons internally, in the opposite direction to the electrical balance present on the surface. The electrons flow internally from a negative region, to a positive region - this is the normal direction of electric current. This reversed internal polarity plays a significant role in the stars other processes, as we will see in a moment. Inside the star is a series of rings of magnetic flux filled with plasma, a collection of these rings is technically called a plasmoid. Each ring is a closed loop of Birkeland current. It will exhibit the same properties and be surrounded by what is called a 'double layer', which acts like insulation and it is a one way street for charged particles. This allows the plasmoid to absorb and trap electrons, while pushing away positive particles. This will allow a build-up of internal electrical energy, and we propose this causes an expansion in the diameter of the plasmoid loop. In this regard we are not talking about the diameter of the tube itself, but rather the ring structure it forms, and as it expands, the plasmoid will start to press against the inner surface of the Sun. As the solar cycle progresses, we see that sunspots appear, and these are identified by orthodox science as magnetic flux tubes puncturing the surface of the Sun - this is also our conclusion. Sun spots emit high energy electrons and ions, consistent with the behaviour of plasma currents. Sunspots appear as pairs, equally spaced - one above and one below the equator - each pair has opposing polarity. This is consistent with a single loop, coming out of the northern hemisphere (for example), and plunging down into the southern hemisphere of the Sun. We have proposed that a plasmoid lies inside the Sun, and these plasmoid loops have a geometry that matches the appearance and location of the sunspots. Therefore we propose that the sunspots mark the intersection of the internal plasmoid loops with the Suns surface. We observe that the first sunspots of any cycle appear at their highest latitude, far from the Suns equator. We observe that prior to their emergence one end of the Sun becomes dark - a coronal hole. We proposed that electrons had built up on one of the Suns hemispheres and had been depleted from the other. That means a very large difference in charge, a voltage, has appeared between the northern and southern hemispheres of the Sun. We propose that the internal flux loops are driven by this high voltage to expand and penetrate the surface of the Sun. When the flux tubes are inside the Sun, they converge at the central core, and must flow in the same direction as the central flux tube. However when these loops connect to the surface, the high voltage will force them to transfer electrons in the opposite direction. These flux lines will be supercharged with electrical current, they will start to re-balance the electrons on the surface, and they flow in the opposite direction to the axial current. The electrons will follow these loops, and move from the over charged end of the Sun, and flow to the end which is depleted in electrons. Therefore we propose that the first spots to appear are caused by plasmoids at their highest energies. Because the sunspots appear suddenly at these higher latitudes, we also deduce that it requires a threshold of energy for the plasmoids to penetrate the surface. Therefore the Sun must first become electrically imbalanced, and when it reaches a high enough energy threshold (voltage), then the plasmoids 'snap' through the Suns surface and sunspots appear. The electrons flow through these loops inside the body of the star, and only their magnetic field pierces the surface and completes the loop. However, at times we can see some loops become energetic enough to rise above the surface of the star. At the start of the process, only a handful of sunspots appear – and there are not enough connections to conduct a large flow. More and more appear as the Sun progresses through the solar cycle. The increase in electrical connections causes an increase in power, and the Sun approaches solar maximum. When the Sun is at solar maximum, the highest numbers of sunspots are observed, and the solar wind is also at a maximum. As the solar cycle passes its maximum and starts to wind down, sunspots converge towards the equator and finally vanish at the end of the cycle. We draw the conclusion that the high energy period near solar maximum occurs because the energy flowing through the plasmoids is at its peak. At the peak of the energy cycle, the Suns magnetic field suddenly collapses and re-emerges with opposing polarity. This is an amazing phenomenon, but can our model explain this behaviour? We have identified that the solar maximum is caused by the maximum discharge rate from the plasmoids - but what causes the reversal? If we recall the contribution of the central (or axial) flux tube, then an answer presents itself. Logically, the axial flux tube must be producing the major magnetic field of the Sun. If this internal electric current reverses, then the direction of the Suns magnetic field will also reverse. When the loops are running at their peak energy, they are flowing in the opposite direction to the axial flux tube. The loops converge into the Suns centre, and run adjacent to the axial flux tube – they must exert electrical and magnetic forces on it. Additionally, the electrical flow through the loops must be causing a change of voltage not only on the Suns surface - but also internally. Therefore when the loops are at their maximum power, the axial tube is expected to be at its weakest. Therefore we propose that at their peak energy output the flux loops cause the interior of the star to reverse electrical polarity, and force the axial current to reverse direction as well – a solar magnetic reversal. The balance between these opposing flows must control the overall solar cycle - it determines the moment when reversal occurs, and determines the overall length of the cycle. After the reversal, the charge driving the solar cycle is being re-balanced, and this leads to a steady decrease in electrical power. Therefore the energy in the loops is decreasing, and we observe that the sunspots move closer to the equator. This is consistent with a plasmoid loop that is losing energy and contracting in size. We conclude that the energy finally falls so low that it is no longer sufficient for the loops to penetrate the Suns surface, the sunspots disappear, and the loops are pushed back inside the body of the star. This is the period of the solar minimum, and the Suns energy is low. After the central flux tube reverses its polarity, it will be flowing in the same direction as the loops. This allows the surface and interior to be electrically rebalanced, and when the process is complete the flux loops lose power – collapse into the interior, and disengage from the shell. The axial tube however continues to flow, moving electrons from one end of the star to the other. This leads to an electrical imbalance. When the voltage is high enough, the loops expand through the shell – and reverse their polarity once again. We propose that this build-up and subsequent release of electrical energy is what we call the solar cycle. While we have proposed a general theory, the precise mechanisms are expected to be more complex. However we have identified a relationship between the outside and inside of the star, they are almost certainly electrically opposite. We have also established that the flux loops are able to accomplish an electrical polarity reversal of the shell, and therefore the inside of the star must also switch. Therefore we have identified the most likely mechanism, but more observation, research and debate is needed. When we examine the solar wind, we find that it is filled with both ions and electrons – where are they coming from? When the plasma tubes are piercing the Suns surface, many of the high energy particles contained in could able to escape the confines of the plasma tube. Therefore the particles in the tubes are being transported from one end of the Sun to the other, but some are also ejected away into space as the solar wind. While some electrons might be ejected from the plasmoid, that mechanism seems insufficient to explain the large population of electrons moving away from the Sun. We must imagine a process that allows electrons to move from the surface, and into the layers of the Sun's atmosphere – almost certainly this must include the super-hot corona – and the presence of a large electric current would nicely explain its extreme heat. When we think about how this might occur, we must consider the surface and atmosphere of the Sun, especially the brightly lit photosphere. This brings to mind one of the simplest electronic devices invented – the vacuum tube. This device can move electrons through a vacuum, and that is just what we have in mind. The process is called thermionic emission – which is technical speak for – 'gets hot, makes an electric current'. If the Sun is surrounded by an electric field, it will force electrons to the surface, making the Sun similar to a 'cathode ray tube'. A ‘cathode’ is a source of electrons, and electrons flow from the cathode and towards the 'anode'. (Note: The definitions of cathode and anode can be quite confusing when dealing with both chemical exchange and thermionic emission in a single system. Therefore it is best to explain that in my model - the interior of the star is a source of electrons, these flow to the surface which I then identify as a cathode layer - from there the electrons are ejected upwards via cation exchange and thermionic emission. They are forced upwards due to the presence of an intense electric field around the Sun which is caused by surface gravity, which I explain later. 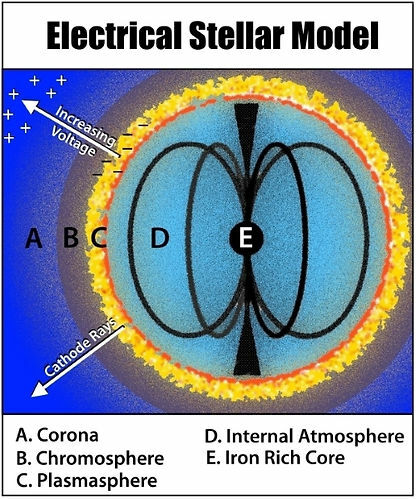 It is a matter of definition whether you want to call the surface an anode or a cathode, what matters is that electrons are ejected from the surface into the atmosphere - they are accelerated by an electric field - and the field is highly positive in the outer corona compared to the Suns surface. This agrees with the arrangement of the Safire project - I was initially confused by their use of the term 'cathode' to explain the electron receivers on the inside of their chamber - but this seems to be a problem with definitions, not with a description of the physical process.). Let’s examine this process called thermionic emission as it relates to the vacuum tube. In its simplest form the vacuum tube is a glass bulb filled with vacuum and it has two metal strips inside it – electrodes. One electrode is heated, this is called the ‘cathode’, and the heating pushes electrons to the surface and they are carried away to the other metal strip, the ‘anode’. The anode must be raised to a higher positive voltage than the cathode, and it then attracts the electrons and creates an electric current. Electron transfer will not occur until the anode is at a higher voltage than the cathode. This current occurs as a cathode ray, a kind of particle beam that transfers electrons. Some bulbs are filled with gas, such as mercury vapour, in order to assist the transfer of electrons to the anode. The outer electrons of a mercury atom are easily stolen away, so it becomes positively charged. The electrons from the heated cathode then jump across onto the mercury ions, and continue to jump from ion to ion to reach the anode. When the tube is powered, the mercury vapour emits a glow as the electrons flow through it. When we look at the atmosphere of the Sun we see several layers, the lowest is the plasma region of the photosphere, this is the surface of the Sun we can see. The next higher layer is the glowing chromosphere, and then a transition region, followed by the outer corona. The regions between the surface and the corona all contain positive ions, and the chromosphere especially emits a distinctive glow. The corona contains highly ionized and energetic particles - specifically it contains a lot of iron (Fe). The photosphere (Sun's surface) resembles the cathode (heated metal strip) of the vacuum tube, the next layers (chromosphere etc.) are low pressure ionic vapour, much like a mercury vapour, and the outer layer is the corona. If the Sun is similar to a vacuum tube, then the corona must act as the anode, and for that to occur it must have a higher voltage than the surface. Why would the corona have a higher voltage? Once again we are stepping outside of the known, and into the unknown, so instead of trying to define it as this point - let's just apply some local knowledge. We notice that electrons constantly leave the Earth, they jump into the sky, and they continue to accelerate - there is an electric field around the Earth. A similar electric field was recently discovered around the Moon. We are proposing these objects they were formed by the same mechanism and have similar processes – specifically we propose they are all surrounded by an electric field. To explain the existence of this field is complex, and it will be dealt with later in the book. When we examine the photosphere compared to the corona, we find the photosphere is cooler, and the corona is extremely hot, 1-2 million K. If there is an electric field around the Sun, then electrons are being accelerated away from the surface of the Sun and they reach their maximum velocity and energy when they arrive in the corona. On the general list of unsolved questions in physics we have “Why is the corona so much hotter than the Sun's surface”. The structure discussed is logical and satisfies the observations we are aware of, and if it functions in this manner, then this solves another mystery of orthodox science. It is worth mentioning the difference between temperature and heat in this context, because the corona has extremely high temperature, but low heat. If we placed an object, a book for example, in the super-hot corona - it would survive much longer than a book placed on the Suns surface. Heat is the total energy contained in a substance due to its temperature, and the corona is a very thin and diffuse substance - it does not contain much heat. Even though the Suns surface is at a lower temperature, it is formed of a much denser substance, and contains vastly more heat. Therefore if the Sun is electrically powered, the structure is more or less identical to a mercury vapour vacuum tube. The Suns surface (photosphere) functions exactly the same as a cathode, the chromosphere and transition layers act as the mediating mercury vapour, and the high voltage particles of the corona act as the anode. The flow of electrons moves from the surface, through the chromosphere and into the corona. At that point there are a few possibilities, they might be beamed away as cathode rays, they might simply flow away from the Sun with the Solar Wind, or they might preferentially follow the inter-stellar current. There is evidence that all three of these mechanisms occur. There are certainly electrons contained in the Solar Wind, and we can measure these as they leave the Sun and flow into the interior of the solar system. However there is another point of interest in these measurements, the electron density of the Solar Wind is asymmetrical. There is a difference depending on if you are to the north or south of the Sun. “We find a mean electron density of 2.65 cm−3 in the southern hemisphere which is about 8% larger than in the northern one.” This indicates that electrons are moving away in a preferred direction – the logical conclusion is that this flow is aligned with the inter-stellar current. Our observations reveal electrons flow away from the Sun in the Solar Wind, but we also notice 'beam like' electrons flashing away as well – similar to cathode rays. A cathode ray is a tightly constrained jet of electrons, it is not a light ray - it is a particle beam. It has different properties to light rays, namely that it can be deflected by electric and magnetic fields but light cannot. Therefore we deduce that some of these electrons are transported away by positive ions in the Suns atmosphere, and others are transported as cathode rays. It is observable that many of these electrons do not stop at the corona - rather they are ejected very long distances into the solar system. Therefore the entire interior of the solar system can receive electrons from the Sun, it contains matter and has higher positive voltage than the surface of the Sun. An electron strahl is much larger than any 'cathode ray', but we have identified plasma as a fractal substance - producing identical phenomena at different scales. Therefore we suspect that the strahl is precisely what it appears to be, a gigantic cathode ray. The atmosphere of the Sun, especially the corona, must be part of the 'anode' of this system, and these processes will cause the star to have a super-heated corona - matching the evidence we have examined. Therefore we have an electrical stellar model which matches observations, and this is the most obvious possibility for an electrical star. An electrically powered Sun also supplies us with an explanation of stars which have been observed to rapidly change luminosity, because electric currents can undergo rapid changes. Such changes might include a change of conductivity in the plasma, a new circuit being added, two flows converging and so forth – there are innumerable ways in which electrical currents can suddenly change. At the conclusion to this section, we still have not explained why there is an electrical field around the Sun - nor have we fully explained how it generates energy. The answers to these questions require further understanding of the very fabric of reality - and we will advance on that topic in the final section of the book as we look at the fundamental structure of the universe. your iron core is undergoing induction from being within the galactic current. Gravity isn't a factor. the sun doesn't generate energy. it dissipates it. Like a heater or light bulb. I don't agree with all your ideas but great effort none the less. Webbman wrote: your iron core is undergoing induction from being within the galactic current. Gravity isn't a factor. While perhaps you were trying to be polite, I found your response quite dismissive, but I will try to respond to your statements. I'm not really sure what you mean by "your iron core is undergoing induction from being within the galactic current" - as I'm sure you are aware, induction is the transference of energy between electric currents and magnetic fields - so a solid object doesn't participate. As I explained, the magnetic field, and particularly the plasmoid loops are responsible for the induction process - and they either penetrate the core, or they may corkscrew around it. You said "Gravity isn't a factor". However, so far there is only one well known theory of gravity - General Relativity - and that theory is based on a logical fallacy. Einstein identified a concept, 'the field' as something that could occupy a volume - in other words his theory is based on the idea that concepts in our head can magically appear in physical reality - clearly that is incorrect. Unless you are referring to an alternative explanation for gravity - then gravity cannot be dismissed, based on the fact that it is not understood. However, I have developed a complete gravitational theory, based on the motion of the aether. The motion of the aether around a solid body not only creates the force of surface gravity - it also creates an electric field. The aether theory of gravitation is one of the missing elements of the EU theory - and I would be happy to explain the theory, or people can find it in my books. Because I have not explained aetheric gravity, then it is possible you aren't able to follow the model I have presented. As far as I am aware nobody else has derived a mechanical explanation for gravity. Gravity is indeed a factor, not Einsteins version - rather the aether behaves like a plasma (although it is not a plasma) - and the positive particles flow towards the surface of the Sun. In actual fact, there are no particles, and they do not flow - but these are useful concepts for the purpose of illustration. The density gradient in the aether causes an electrical potential, a real electric field. This field also exists around every other large celestial body, and has been detected on the Earth and is called 'atmospheric voltage' - its what drives lightning bolts into the sky. The field has been detected around the moon, and it deflects the solar wind and accelerates electrons away from the moons surface - showing it has the same orientation as the field on the Earth. This electric field around the Sun generates the FORCE that accelerates electrons up and into the Suns atmosphere. The aether theory is contained in my works and is quite complete, with mechanical explanations for energy, light, heat, mass, gravity, and magnetism. There are two different types of gravity, surface gravity (inertial), and long range gravity (radiant). You said that the Sun only dissipates energy, however that can only be a belief - because there has been no measurement of the energy contained in the interstellar electric current. So at this stage we are completely unable to determine if the Sun generates energy, or it simply dissipates energy - because we are not aware of the contribution of the interstellar current. However, what we do find is the presence of neutrinos - and these originate in the surface of the Sun - this indicates very high energies, and we have reason to suspect that there is local energy generation at the surface. The Sun must certainly generate energy, or rather the gravitational field around the Sun generates that energy by accelerating electrons and ions. While the Sun also captures energy from the interstellar current to power the internal electric currents - it is also generating energy due to the electric/gravitational field that surrounds it. The entire EU theory is based on the idea that the Sun sits in an electric field - but they have been unable to provide an explanation for the existence of the field. My gravitational theory is able to solve that problem. The model I provided also solves a number of other problems related to structure and operation which have not been solved by EU at this time. not so. you pondered two questions at the end of your ideas and I gave you my thoughts on those. I believe in the aether as much as you do. I wasn't dismissing your ideas at all. Perhaps you wanted more indepth discussion. Either way I'm sure that there are plenty around here that will give your post the appropriate attention. This thread is being moved to the NIAMI board as we are quite clear within the guidelines regarding people's own theories. Matthew please understand that this in no way denigrates your ideas, they could just as well be "new insights" as "mad ideas" (and certainly merit healthy discussion) but as you are clearly offering a proposal somewhat in conflict with the published EU ideas (particularly where gravity is concerned), the thread needs to be moved. I note you mentioned having "tried" to send your material to Wal Thornhill and that he may not have got around to them. I can't quite work out what this means (perhaps digital copies were offered but not taken up?) but as Wal has been extremely busy this last year or two, it may well have been that he's missed them completely. If you could PM me we can discuss this in more detail, thanks. Very interesting theory. I read the text once, but will read it again to make it sink in a little more. You say it fits SAFIRE findings. I've been searching for those "findings" myself. So far, I can't find them anywhere. Are there conclusions, and what are they? Where can I read the LATEST news about SAFIRE? AmagnonX wrote: Many electrical models for the Sun include an electric current flowing through space inside the solar system – however there is no evidence to support such an idea. Therefore we concluded that the Sun must be powered through magnetic induction. This is a very familiar process, and is used to distribute power from electrical stations to domestic users. The principle relies on winding the electric wires into coils, and creating magnetic flux – the flux then connects two sets of coils, and electromagnetic power is transferred without the need for a physical connection. In this model, the Sun's magnetic field is energized by charged particles flowing past our solar system – this flow has been observed and is called the ‘interstellar wind’. The magnetic flux lines from the Sun then converge, and energy is extracted locally by the Sun through induction. That's quite a bit of induction. Since interstellar wind is mostly found at the heliosphere, is that where you are proposing that induction is taking place? Alfven did expect some spin momentum of stars to be converted into electricity via induction, but it wasn't necessarily his primary power supply. If some powerful magnetic fields are required to flow through the solar system and the core of the sun, wouldn't we expect to see those same magnetic field changes to manifest itself in our magnetosphere too? As I'm following your model, the *surface* of the sun is a cathode with respect to the surrounding "space" like any standard Birkeland cathode solar model, and it's the source of the cathode rays that flow into space. Birkeland's model was of course mostly *internally* powered, though it could be sharing some currents between stars in the galaxy much like Alfven's solar model. If indeed it's a cathode surface model, could you explain which specific parts are consistent with the SAFFIRE results, and which data sets you're using? As I understand it, the SAFFIRE project was based upon an anode surface model. I'd assume that some processes would be the same (like coronal loops) however, regardless of the polarity. At the link above you'll find another example of a cathode surface (Birkeland) solar model. I also believe that the solar atmosphere is mass separated by the element, with the sun's corona being mostly hydrogen, the chromosphere is mostly helium, and the surface of the photosphere is mostly neon. I also believe that there's a silicon plasma layer that is located underneath of the neon plasma double layer. Unlike your model, the cathode surface model described on that website is internally powered by fusion. It's meant to be a pure Birkeland solar model that happens to contain a mass separated atmosphere. IMO the *coronal loops* and particle collisions from the flow of cathode rays ultimately produces most of the excess heat in the solar atmosphere. The constant flow of electrons is moving the heat away from the lower layers and up into the higher layers. Well spotted - yes, the Sun cannot be purely powered by induction, however I added notes at a few points to indicate that gravity is the power source. This is not gravity as defined by Einstein however, but rather it has a mechanical description. The proposal is that the motion of the aether governs the motion of plasma - in other words, what we call plasma mechanics is in fact a derivative of aether mechanics. Therefore the aether acts very similar to a plasma. While it is not comprised of 'particles' so to speak, there are defined charges, and these can be separated and they flow in opposite directions. The aether is considered to be a universal substance which has the property of tension, it is an elastic, continuous, stationary material which contains geometry - the equilibrium state of the geometry is the vector equilibrium. It is able to form surfaces which define polygons. The surfaces have no thickness and are conceptual only - there is no intervening substance. The aether behaves as if it were a plasma and "virtual particles" (geometric shapes) exist within it which are interpreted as having positive and negative charges. These shapes can change geometry, giving the illusion of motion - these flow in opposite directions due to the requirement of maintaining equilibrium - if small polyhedrons move in one direction, large ones move the other way. The thesis is that gravity represents a "flow" of positive "particles" of the aether towards the Suns surface. This generates an electric field, which is negative near the surface and increasingly positive with elevation. This accelerates ions downward and electrons upwards - at the Suns surface this generates a lot of heat. It is proposed that a lot of the positive 'particles' of aether are condensed in the Sun and form electrons - other positive 'particles' are ejected away from the Sun along light rays. If some powerful magnetic fields are required to flow through the solar system and the core of the sun, wouldn't we expect to see those same magnetic field changes to manifest itself in our magnetosphere too? I don't propose any magnetic field other than the one we have already detected around the Sun - my proposal is that the Suns field is arranged like any other magnetic source. The field lines run through the Sun and out of the solar system, as far as I am aware all of this has already been established by measurements. All I'm suggesting is that the magnetic flux which goes through the axis of the Sun carries electrical current through the interior of the Sun, but not outside of the Sun into the interior of the solar system. When these flux lines extend beyond the solar system (and heliosphere) - they connect stars, and direct charged particles. We see plasma filaments connecting stars, and I am just suggesting that the magnetic flux that confines the plasma - penetrates the solar system, and the axis of the Sun. When its inside the solar system, it does not conduct a significant flow of particles. This was a very general statement, and I am not talking about quantified data - just observations. The anode of that system gets surrounded by hydrogen ions, so the plasma surface which surrounds the anode is in fact a cathode .. so essentially it is not really a different model. That's one of the things that confused me when I read about it .. anode .. cathode .. er ..
My understanding is the anode is a source of electrons, and is being held as a negative voltage with respect to the 'cathode' receivers. That will produce precisely the voltage gradient that I assume in my models - therefore while my model is named a 'cathode model' - the SAFIRE experiment is actually an identical arrangement. In terms of the findings, they produced a great deal of heat - but the anode interior was quite cool - that is consistent with my model. So in terms of the findings, they were able to make it go - and create a plasma layer on the anode, generate a lot of heat - they also had some very symmetrical geometric instabilities, which is what I would expect under the low voltage conditions they have been using. I think they will get more interesting results when they start to really increase the voltage - but they will need to maintain low current as their equipment is pretty high powered - they could fry stuff pretty easily. So they will need to start with high plasma content, and then drain the container as they ramp the voltage up. Michael Mozina wrote: I also believe that the solar atmosphere is mass separated by the element, with the sun's corona being mostly hydrogen, the chromosphere is mostly helium, and the surface of the photosphere is mostly neon. I also believe that there's a silicon plasma layer that is located underneath of the neon plasma double layer. The model is interesting, and there are good reasons (based on my gravity model) to expect elemental separation based on degree of ionization and atomic mass. However, I thought spectro's of the corona indicated high levels of iron? I guess the data is around, it should be easy to check your conclusions against the spectro's that have been done - most of the layers have been looked at pretty well, so there should be data on the composition. Anyhow - thanks for having a look and leaving some comments, let me know if you have further questions. AmagnonX wrote: The thesis is that gravity represents a "flow" of positive "particles" of the aether towards the Suns surface. I should also be clear, this relates to surface gravity (inertial gravity) only, and that I propose a different mechanism for forces which act at long ranges between celestial objects. Long range gravity is called "Radiant Gravity' and is transmitted via light rays - which are twin filament aetheric connections, basically identical to a Birkeland current. The rotation of these filaments is intepreted as 'frequency' and the length of the twists in these filaments is interpreted as 'wavelength' - however, these are not waves. This mis-identification lead to Einteins mistake regarding special relativity. The light ray is an object - it has no velocity - it just rotates and transfers aetheric particles. The passage of a positive flow through an atom via a light ray attracts the electrons inside the target atom - which generates a force of attraction that we call 'gravity'. If the light rays has high current it can pull the electrons out, and ionize the target atom. Radiant gravity attracts neutral particles, but repels positive ions - it is the force that keeps the ions suspended in the Suns atmosphere. They are held ina state of balance by inertial gravity which pushes them towards the surface, and radiant gravity which repels them. The balance of these forces will cause a layering effect in the Suns atmosphere. AmagnonX wrote: The photosphere (Sun's surface) resembles the cathode (heated metal strip) of the vacuum tube, the next layers (chromosphere etc.) are low pressure ionic vapour, much like a mercury vapour, and the outer layer is the corona. If the Sun is similar to a vacuum tube, then the corona must act as the anode, and for that to occur it must have a higher voltage than the surface. Why would the corona have a higher voltage? You seem to be in good agreement with Don Scott's model of the elctrical sun here. One question that springs to mind is, how does the corona maintain its voltage relative to the surface? If it creates a potential that atracts electrons, the arrival of those attracted electrons will act to reduce the voltage differential, and over time one might expect the phenomenon to die down. Any thoughts on how or even whether the corona will be maintained over a long time period? In my model, the voltage is maintained by the gravitational field around the Sun .. this is in some sense a density gradient in the aether which produces an electric field. This is different from a regular electric field, which I would call a potential field - surface gravity creates a REAL electric field, which is caused by a pressure differential in the aether. You cannot rebalance an aetheric potential simply by adding more electrons - the mechanism of the field is different. A buildup of electrons might produce a potential electrical field, but not a real field. The real field is not rebalanced simply by the presence of regular matter. The aether is the driver of electrical transactions - the electrons must rebalance themselves through very conventional processes - the aether however is not constrained by the same restrictions as conventional matter. We should also note the physical evidence, which is that the solar wind is full of electrons moving away from the Sun. The corona must be regularly purged of excess electrons - and .. hmm .. that is actually way too complicated to talk about - because the mechanism is uncertain, and to discuss every possible method (including the fundamental processes behind each one) is simply too much to deal with. Basically, for the simple answer we can simply observe that the solar wind is full of electrons - if they initially migrated to the corona, then some mechanism must subsequently displace them. (I have a lot of possible mechanisms - but I think experiments might be the best approach). I had a few drinks when I made the previous post - so allow me to provide a more sober assessment. I think high energy radiation in the corona will keep pulling electrons off the atoms, and they will continue to be purged in that manner and remain positively charged. The effect we call ionization is caused by a fundamental force which I call "Radiant Gravity" - this is different to surface gravity, which is best called "Inertial Gravity". Although radiant gravity is a fairly simple idea, it is necessary to introduce a few other concepts prior to a full explanation. I will make a few posts to outline the reasoning behind it, either today or over the next few days.